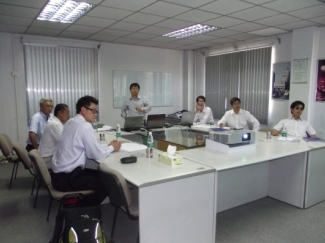 We often invite different parties to come and visit our factory. The visitors could witness the cooling tower manufacturing, assembling, testing, and any other aspects that they are concerned in respect to the cooling towers. On the other hand they would bring along their creative ideas and valuable comments regarding the fields they are familiar with or interested in and these are great opportunities for us to improve our products and services. We encourage our staff to go outside to attend various seminars and training courses such that they can broaden their views in the industry and enhance their capabilities in production, management, logistics, project coordination, etc. We cherish our staff because they are our assets. They dedicate themselves to the industry and pay a lot of efforts to ascertain the high quality of our products and that's the way people around the world could use our reliable and high performance cooling towers. As a reward, we often organize all kinds of activities to help them enjoy their daily lives in the company and let them be part of the company.